I had this conversation years ago with another food blogger, and I tell you this because for even a food person to not know how to make mustard tells me that it must appear to be magic to most people. But it ain’t. If you have mustard seed and water, you can make mustard. It’s that easy. And pretty much every culture in the Northern Hemisphere has done so: Mustard is to the North what chiles are to the tropics. Mustard is a condiment of a thousand faces. Some are smooth, others almost entirely made from barely cracked seeds. Vinegar is often used, but wine, beer, grape must, and even fruit juices are used to moisten the seeds. Sweetness is usually achieved by adding honey; an American “honey mustard” can be a 1:1 ratio of mustard to honey. A Bavarian sweet mustard, however, uses only sugar and water: no acid, no honey. Italians put fruit preserves in their mustard. Mustard is one of Europe’s few native spices, although it also has been used in Chinese cooking for around 2,500 years as well. Ancient Rome was quite the hotbed of mustard-making, and it is Rome that gives us our name for mustard: It is a contraction of mustum ardens, or “hot must;” the Romans often added crushed mustard seeds to unfermented crushed grapes. I’ve recreated a Roman recipe for mustard that uses almonds, pine nuts, mustard seed and red wine vinegar. 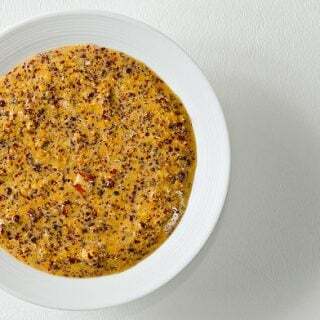 The basic idea behind making mustard is this: Grind seeds and add liquid. At its most basic, this is all mustard is. Both Chinese and English mustard (think Coleman’s) is nothing more than water and mustard powder. But there are some things you need to know to make great mustard. First, you need cold liquid. 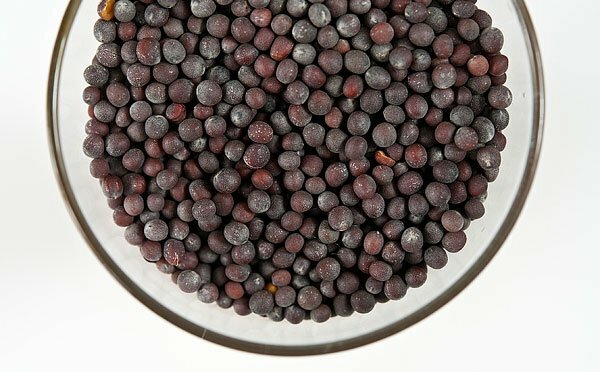 What gives mustard its bite is a chemical inside the seeds reacting with cool or cold liquid. You also need to break the seeds to get at the fiery chemical — it’s like cutting an onion. Heat damages this reaction, however, so to make a hot mustard use cold water, and warm water for a more mellow mustard. Mustard sauces lose punch when long-cooked, and should always have a little extra fresh mustard tossed in at the end of cooking. This reaction is volatile, too. Left alone, your mustard will lose its bite in a few days, or in some cases even hours. But adding an acid, most often vinegar, sets the reaction in place — this is what happens with horseradish as well. Adding salt not only improves the flavor, but also helps preserve the mustard, too. If you skip the vinegar and salt, you will still have mustard, but it will not keep for long. Not that it will go bad, but it will lose it’s flavor. Once made with salt and vinegar, mustard is nearly invulnerable to deterioration. Mustard is one of the more powerful anti-microbial plants we know of, and, considering it is mixed with vinegar and salt, it becomes a heady mix no wee beastie can survive in. It is said that mustard will never go bad, although it can dry out. 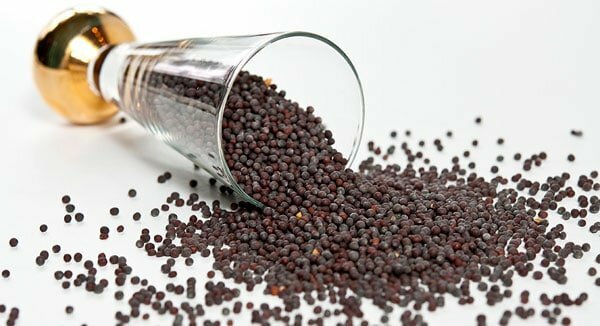 You have three choices when it comes to which variety of mustard seed you use: White, brown and black. White mustard undergoes a different, milder reaction than do brown mustard or black mustard, which are far zingier. American yellow mustard is made with white mustard seed and turmeric, brown mustards are in most of your better mustards, and black mustard is used in hot mustards or in Indian cuisine. Incidentally, the wild mustard all over California is black mustard. You can thank Father Junipero Serra for that one: He used mustard, which grows like a weed, to mark his travels in Alta California 250 years ago. The famous Grey Poupon mustard — Dijon has been a center of mustard-making for nearly a millennium now — is traditionally made with stone ground brown mustard and verjus, the tart juice of unripe grapes. I prefer this style of mustard, and most of my homemade mustards are grainy like Dijon. I grind my seeds with a spice grinder, but you could get all old school and use a mortar and pestle. 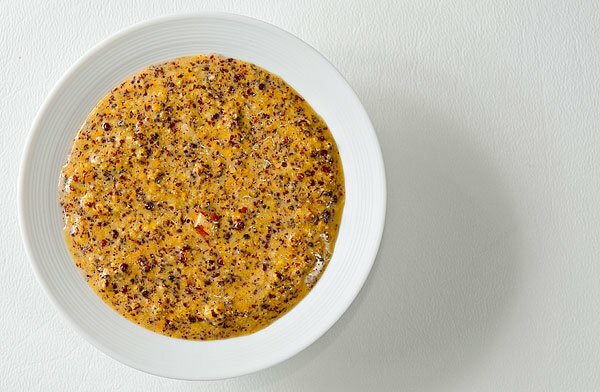 The best mustards, in my opinion, combine brown or black mustard seeds with yellow mustard powder: The two sets of chemical reactions complement each other and made a more complex mustard. Always add water or a non-acidic liquid first, let the mixture sit for 10 minutes or so, then add the acid (vinegar, verjus, lemon juice, etc). Add salt to taste, but it’s typically about 1 to 2 teaspoons per cup of prepared mustard. Finally, let your mustard set in the fridge or in a cool place for at least a day before you serve it. Bitterness is a byproduct of the mustard reaction, but that bitterness fades after a day or so. Pure mustards can be kept at room temperature, but mustards with other ingredients, like the Roman nut mustard I mention above, should be kept in the fridge. So there you have it. Easy-peasy. Now you really have no reason to ever buy mustard again. 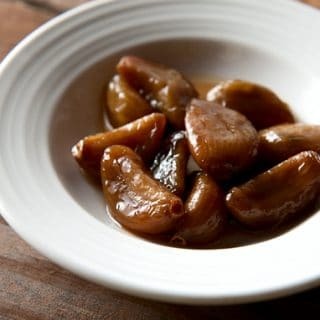 Find more recipes for homemade condiments, pickles and preserves on Hunter Angler Gardener Cook! I am so excited to try! Have you (or anyone reading) tried a cherry mustard? Second batch came out runny. Any way to thicken after the refrigeration step? Rich: Add more mustard powder. I made this and mine turned out way too hot (I didn’t have any brown mustard seeds so I gave it a go using just black seeds) but I already added the vinegar and let it sit for a few days. Any way to rescue it now? Thanks.